Apparently the cauliflower has fallen from favour in the UK, as sales are in decline. Maybe because people favour more exotic vegetables and are swayed by the advertised ‘superfood’ status of things like sweeet potatoes. However, the humble cauliflower is not only tasty, cheap and versatile, it is an eco veg, as it can be grown in the UK all year round saving on food miles. It should also shout more loudly about its own superfood status! Michael van Straten lists it in his Superfood Pocketbook, detailing the cancer-fighting compounds, high levels of folic acid (protects against heart disease and birth defects) and, especially if you include the green leaves, vitamin C and beta carotene. Also a useful source of B vitamins, tryptophan and omega 3! What’s not to love? Cauliflower is a descendant of the wild cabbage from Asia Minor, and has been popular in Turkey and Italy since at least 600 B.C. (Source: www.whfoods.com). Cauliflowers are not easy to grow, but are ‘satisfying’ apparently, check out the allotment keepers site for advice. So how best to eat cauliflower? Delish eaten raw with dips of course. 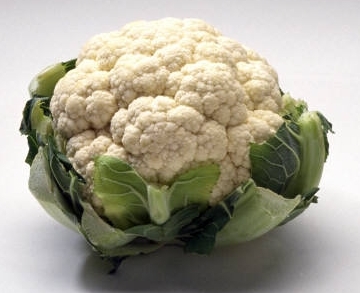 Or take a look at Abel and Cole’s excellent cauli recipes. Or try this 1904 recipe from Early Vegetarian Recipes. Boil a large cauliflower in salted water. Cut up into suitable pieces. Lay them while warm in a thick batter for 10 minutes. Mix some bread crumbs with an equal quantity of grated cheese. Take the cauliflower pieces one by one from the batter, cover with the crumbs, and fry in deep fat. I’m actually one of the people that often overlooks cauliflower. I like it best when it’s mashed and prepared like mashed potatoes. Thanks for reminding me about it! Mmm! Sounds like a great pie topping.